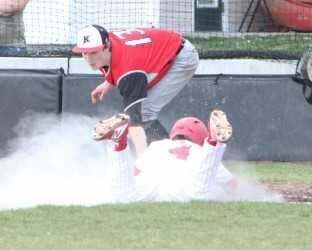 Shelley’s Zach Esplin slides in at home. Shelley’s Creighton Ball grabs a high bouncer against Hillcrest. SHELLEY – To say that the Shelley Russets baseball team has struggled this season may be the understatement of the century. It isn’t that there isn’t some talent on the team or that the players aren’t trying, but the team sometimes seems to be snakebit and an example of that was the end result of a three-game set with the Hillcrest Knights that concluded Friday afternoon. Sure, the Russets are 0-12 on the season and the low point, according to Russets fans, may have been the two-game beat down that county rival Firth gave the Russets in March. The rest of their schedule has been games with the High Country Conference, both 4A and 5A, and the Russets have not found the going any better. This week, it was the Hillcrest Knights turn to take out frustrations or whatever on the Russets. On Thursday, the Knights used the one-hit pitching of Jace Hansen to stifle the Russets. The Russets not only couldn’t get hits off of Hansen, they couldn’t take advantage of the five errors that the Knights committed in the game. To make things worse, the Russets’ pitching was pretty good on the afternoon as they only gave up eight hits. The killer for the Russets’ pitching was the six errors that the defense made behind them. This game should have been much closer, but you can’t give away runs in a tough conference and expect to win. The final score of 8-0 was not reflective of the game at all. Zach Esplin got the only hit for the Russets on the afternoon and the team calmly packed up for the Friday doubleheader. The game on Friday was a much different contest than what’s been seen of the Russets this season. They came out and they battled and scrapped and they played baseball. After three innings, the Russets held the lead 6-4 and were playing like they knew what the game was all about. The bottom line is that they looked like and acted like a baseball team. Trey Lott was on the mound and he was doing his best to make the Knights earn each and every hit they got. It was the defense once again that did the Russets in or they would have earned their first win of the season. It all came unglued for the Russets in the top of the fourth inning, when the Knights scored four times, all of them unearned. It gave the Knights a 7-6 lead and they would add another run in the top of the sixth inning, never to give up the lead the rest of the game. The Russets didn’t quit or give up in this one, and when they scored a run in the bottom of the seventh inning, there was hope in the hearts and minds of the Russets. They had cut the lead to 8-7 and they were in with a slugger’s chance at a win. It just wasn’t to be. The Knights took care of business and closed the Russets out to take the game despite the effort. Esplin again led the offense with four quality at bats, coaxing three walks on the afternoon and Blake Leal contributed a pair of runs batted in in arguably the best game of the season for the Russets. The second game of the series may have been the one that hurt the most. It almost looked like the Russets simply mailed the game in. They gave up 10 runs in the bottom of the first inning, contributing errors to the hits and they were playing catch up from the very beginning. 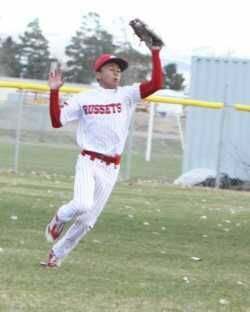 The Russets only got four hits of their own, and when Trey Lott gathered up two of those four, it just doesn’t lend to a competitive performance. To make it worse, the Knights banged out a dozen hits. The Russets have talent, they just haven’t put it all together yet, but they are running out of games to show what they really have. They will have a game with Thunder Ridge on Tuesday, on the road, with a first pitch at 4 p.m.